Water splitting systems often require materials to operate at demanding conditions, including high temperatures and corrosive environments. These materials often must also meet performance levels exceeding the current state-of-the-art. Specific materials requirements depend on the operating range of the process environment, which requires the creation of detailed process flowsheets and the establishment of state points and material and energy balances. SRNL has unique experience and expertise in thermochemical hydrogen production flowsheet development, modeling, and simulation using commercial off-the-shelf (COTS) software to support conceptual designs, scenario studies, capital and operating cost estimates, comparison of alternative designs, and techno-economic analyses. This capability supports the application of COTS engineering software tools in conjunction with DOE's H2A (Hydrogen Analysis) tool to perform TEAs of solar water-splitting hydrogen production alternatives. Determining the economic impact of the cost and availability of materials requires a realistic analysis of process economics and will need to be a part of HydroGEN. SRNL can support TEA of any hydrogen production system using solar energy as the primary energy source. Process modeling capability ranges from detailed models of specific unit operations to plant-wide process flowsheet models. These models help establish materials performance requirements. In conjunction with life cycle cost estimation, they allow the quantification of the cost-effectiveness of proposed materials improvements. Resource utilization, sustainability, and environmental impact can all be assessed as well. Application of these tools will provide sound guidance for materials R&D investments that will help HydroGEN achieve its long-term hydrogen production cost goals. SRNL's capability in flowsheet development and analysis for hydrogen production alternatives allows credible cost and performance projections for a wide range of hydrogen production technologies. Integrating TEA with materials development programs will ensure that the HydroGEN program will be able to meet hydrogen production cost goals. SRNL is uniquely suited to hydrogen production process flowsheet development and TEA using a variety of COTS engineering software to build models from the unit operation to the plant-wide scale and use them in concert with H2A to develop credible estimates of hydrogen production cost. SRNL originally developed this capability for the Office of Nuclear Energy's Nuclear Hydrogen Initiative, publishing its first nuclear HyS conceptual design in 2004. Since then, SRNL has developed process models and TEAs at various levels of detail for a variety of high-temperature water-splitting technologies, including thermochemical, hybrid, and electrolytic processes, and using solar as well as nuclear heat sources. Many of these processes used non-conventional equipment (e.g., proton exchange membrane SO2-depolarized electrolyzers, high-temperature bayonet decomposition reactors), for which detailed component design and cost analyses were performed. This capability can be leveraged to study the lifecycle economic or other impacts of any hydrogen production component or system. SRNL personnel are available to apply these capabilities toward any HydroGEN program project. The HydroGEN program encompasses advanced electrolytic, photoelectrochemical, and solar thermochemical hydrogen production processes. The most promising materials R&D projects will be those that have the greatest likelihood of helping achieve hydrogen production cost targets. These can be identified credibly by the use of consistent state-of-the-art process flowsheet models throughout the technology portfolio in conjunction with consistent capital and operating cost estimation and TEA. Application of these tools will help ensure that the materials R&D investments provide maximum benefit. Corgnale C, Gorensek MB, Summers WA. "Solar hybrid sulfur cycle water-splitting process," Savannah River National Laboratory, Report No. SRNL-STI-2015-00546, October, 2015. 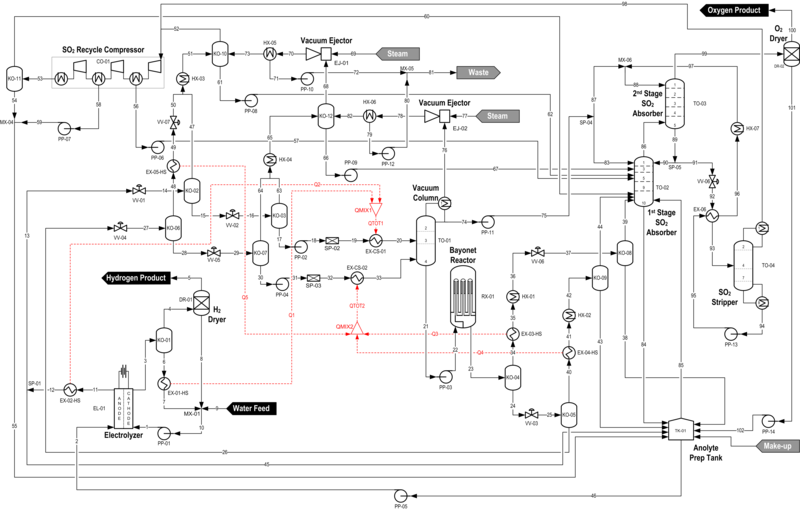 Gorensek MB, "Hybrid sulfur cycle flowsheets for hydrogen production using high-temperature gas-cooled reactors", International Journal of Hydrogen Energy, 36(20), 12725-12741 (2011). 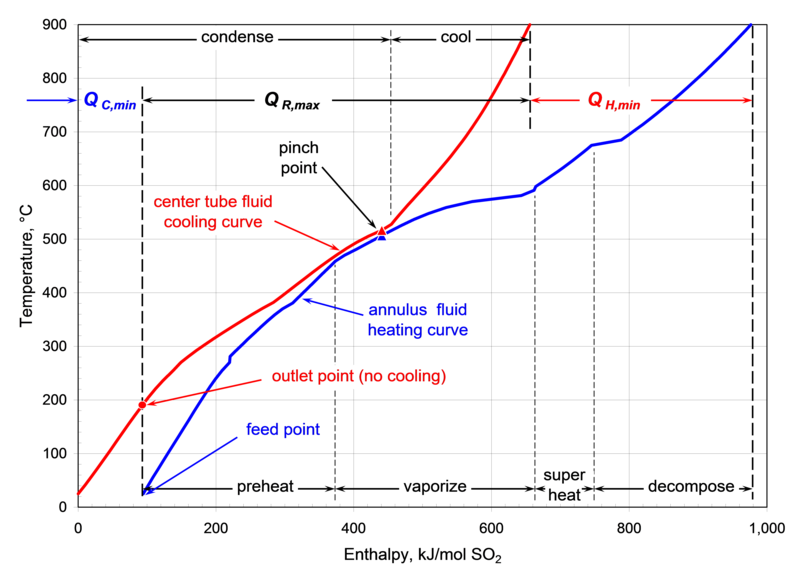 Gorensek MB, Edwards TB, "Energy Efficiency Limits for a Recuperative Bayonet Sulfuric Acid Decomposition Reactor for Sulfur Cycle Thermochemical Hydrogen Production", Industrial & Engineering Chemistry Research, 48(15), 7232-7245 (2009).